One of the most interesting large jigsaw puzzles by Educa: The Capitulation of Granada, or The Surrender of Granada, by the Spanish painter Francisco Pradilla. It surfaces every now and then, but it is becoming very rare. Educa has published three different editions of this puzzle. This is the first one, from 1993, and the preferred one by collectors, with the traditional Educa striped box. The second one appeared in 1995, with a yellow box, and it is probably the rarest version. Finally, the last version appeared in 1996. Even when they produced three different editions of the puzzle, it is still very difficult to find. The puzzle is NEW, with its original FACTORY SEAL. Besides, the box and the seal are in excellent condition, which is very unusual in puzzles this old. 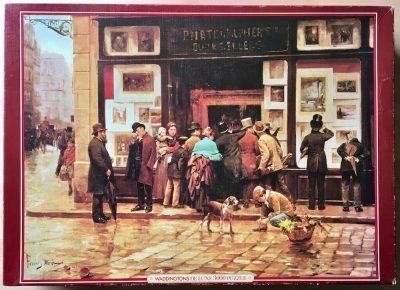 This puzzle continues the tradition of Educa publishing large fine art puzzles. In recent years, they are selecting works from contemporary artists. 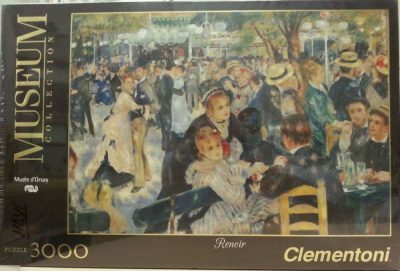 However, many puzzle fans miss the classic art themes, like this one. Puzzle size: 192 x 136 cm. Box size: 46 x 32 x 11.5 cm.